This photograph appears to show a doorway but the entrance to the galleries was through the adjacent wall. Further research is needed to discover the reason for this architectural feature. There does not appear to have been any alteration or addition to the church of any consequence for nearly two hundred years, when, in 1712, a gallery was erected by Richard Edge of Middle Hulton ".. from the Great Door at the west end of the south aisle eastward in length seven yards and a half (as far as the parishioners use that aisle belonging to Henry Hilton, Esq. ), and in breadth from the south wall six yards and two feet, together with a convenient stairs". About the middle of the century another gallery, called the "Singers' Gallery", was built at the west end of the church. A drawing preserved in the Diocesan Registry Office at Chester shows that this gallery adjoining the tower extended into the south aisle and joined the older gallery. Access to the west gallery was by stairs leading from doors built in the west walls of the north and south aisles and near the outer wall of the aisles. In 1833 galleries were erected over the north and south aisles. To erect them it was necessary to add some five feet to the height of the outer walls and to give light in the galleries a second row of windows was put in each gallery. In the Diocesan Registry Office at Chester is a plan of the proposed new galleries, which were to be 7ft. 7ins. above the aisles, and to have three tiers of benches. William Hulton, Esq., was granted permission to erect a porch at the south-western angle of the church, and from this porch led the stairs to the south gallery. 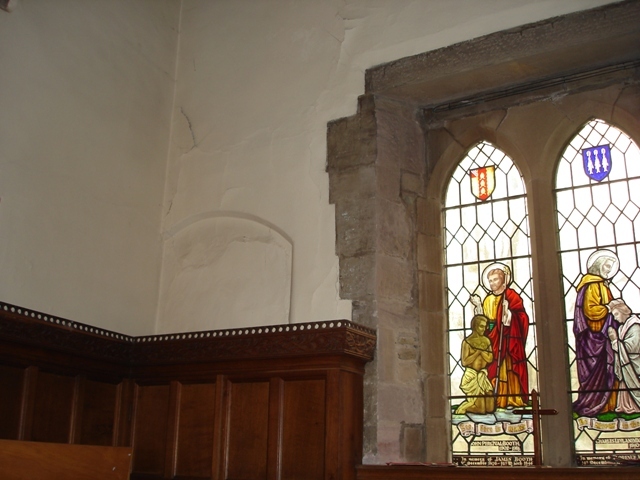 Two stone shields with the Hulton lion and the carved figure of the fisherman were transferred from over the Hulton door to a place over the door of the new porch outside. During these alterations an iron hinge bearing the date "1412" was found on a door. The erection of these galleries provided 420 additional seats making the total accommodation 1,229. At this time there were in the parish, chapels at Smithills, Westhoughton, Horwich, Peel and Farnworth, but additional accommodation was still required because of the increase in population, due in large measure to the Industrial Revolution, which brought many people to Bolton and the surrounding districts. The Rev. H.S.Patterson, in his booklet, Notes on Deane Church, Lancashire, written in 1883, criticises strongly the work which was carried out about 1833. He complains that two-thirds of the ground floor accommodation was rendered defective by the galleries, and suggests that increased accommodation should have been provided by the erection of transepts; stonework in windows and doors was covered with cement; the capitals of the pillars were chopped away rather than alter the woodwork of pews.